In the spirit of St. John Baptist De La Salle, CRDLS students complete service hours each year with those in need. Service hours are recorded and become part of the student’s religion grade. 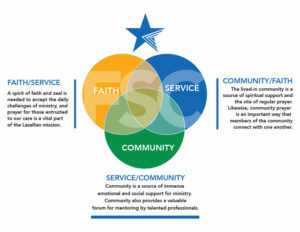 Campus Ministry offers guidance and suggestions for service, in addition to organizing diverse opportunities for students to serve at local non-profit agencies. Campus Ministry oversees this program by organizing group service activities, assisting in the placement of students in service locations, guiding students in reflection on their service, and compiling the number of hours completed by each student. Completion of service hours and the service reflection paper are graduation requirements.